I know that Matt posted the news of the birth of our son Reddin weeks ago when he was born, but I wanted to blog the details of that day, while I remembered them! I'm going to start from weeks ago, when I was still pregnant. 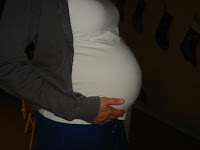 I had been having those annoying Braxton Hicks contractions off and on for weeks. At my 35 week check up my Dr did a check to see if my body was progressing, so that we could have an early induction as we had been planning. My body had progressed quite a bit, and my Dr told me if I went on my own he wasn't going to stop me. I however was determined to make it through Christmas. I really wanted to be able to celebrate with Mattie and let her have all of the attention, plus I really didn't want to be in the hospital on Christmas! 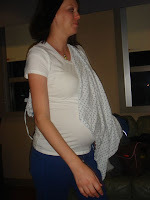 The week before Christmas I started having real contractions on and off. I tried to take it easy to slow them down, because Matt was gone working, and wasn't due back for days. Finally the weekend came and Matt was able to come home and start his leave of absence. I was very relieved, knowing that if I did go on my own, Matt would at least be home for the birth. So, Christmas came and went and on the morning of December 26Th we headed off to the hospital. We got there at about 6:30am, and I got put in the largest delivery room they had! It was beautiful and big! At 7 am my Dr came in to get me started. He broke my water and also put some sort of pill in my cervix to help move things along. 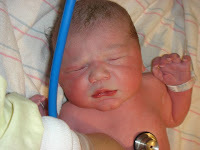 I wanted pitocin right away, since I had it with my induction with Mattie, and I had a very fast labor then. My Dr doesn't like to start right out with pitocin though. I watched Mamma Mia and my contractions started coming about 2 minutes apart. I had already been started on IV fluids since I was planning on an epidural. My nurse came in and it had been about 2 hours or so. She asked if I wanted my epi, and I told her that I wasn't in a lot of pain yet, so I wanted to wait a little longer. She checked me at about 10ish and I was still only 4 cm. I had gone in at 4 cm! She told me that at 11 am my Dr said that they could start pitocin, so I decided to go ahead and get my epi. I knew once pitocin was started it wouldn't be that long. I got the epi and it made me a little drowsy. I fell asleep watching Chronicles of Narnia Prince Caspian. I woke up after about 30 minutes, and was starting to feel pressure and a little discomfort. I hit the pump button on my epi, but it wasn't doing anything. 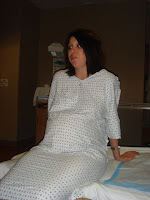 A little while later the nurse came in and told me that my contractions were really coming. I told her that I could feel pressure, so she checked me and I was at 8 cm. My movie had just finished and she told me that I didn't have time to watch another movie! She left to go call my Dr and let him know that I was almost ready. Well, she hadn't even been gone 5 minutes when I looked at Matt and told him that I needed to push! I hit the call button and told the nurse. She came in and checked me again, and then had me roll on my side, since my Dr really didn't want me pushing until he got there. He said he would be there in less than 5 minutes, and he was! They hurried and got everything ready and then he said, "Ready to push this baby out?" I was! But, I have to say that I was a little nervous. It took my 2 hours to push Mattie out, and I had a grade 4 tear from her. (This was the reason for an induction at 38 weeks. My Dr was hoping to get us a 7 lb baby!) With Mattie I couldn't feel a thing, but this time I was having to breath through my contractions and I could feel all of the pressure! I was nervous that I was going to be feeling all of this pain for possibly 2 hours! But I got very lucky, since that was not to be my fate this time around! I started pushing with the next contraction and I got 3 pushes out of that contraction. Then with the next one I got 3 more pushes, and I could feel lots of pressure! Matt looked at me and told me that his head was already coming out! I couldn't believe it. It took me over an hour and a half to get to that point with Mattie. I knew that I needed to give a couple of more really good pushes, and sure enough on the third push of the next contraction Reddin was born! When they put him on my chest I knew that he was not 7 lbs, because he looked bigger than Mattie had. And, he was! 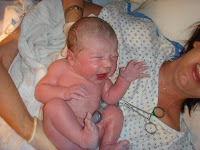 He weighed 8 lbs 9 oz and was 21 inches long. It took 6 minutes of pushing this time, and nine pushes all together. I preferred this way too. I felt pain, but I will take that over the no pain at all, if it means they come out faster! My first impressions of Reddin were that once again our child looks like Matt! Although, I can see a little of me in this one! Matt loves to point out that Reddin has a cleft in his chin like me. Only time will tell what he's really going to look like. Mattie still looks just like her father though! My recovery room was also very nice. The nurses and staff were all amazing. Having a child in FL was much different than having one in UT. In UT I kind of felt like a number and no one was super personable. I know that its not really their fault, since so many children are born in UT everyday! But, the experience here was so fabulous, from my awesome Dr, to the beautiful rooms, to the wonderful nurses that took care of me and Reddin! I'm also grateful that my mother was once again able to be there for the birth. It was really nice having her and Matthew in the room with me. I would have loved to have had my mother-in-law Teresa in the room again, but having a baby at Christmas makes for hard stand-by travel! I'm very grateful for all the visitors that came to see me and Reddin. It was a wonderful experience, and was just about as perfect as could be! I love my sweet little Reddin! I am so grateful that he was finally able to join our family. I felt his presence for the first time as my nephew Luke was being blessed almost 5 years ago! I knew that we were suppose to have a baby and I really thought it would be Reddin when we did. We had just got married and I wasn't ready to have a baby yet. When I couldn't put off the prompting any longer and decided to get pregnant, I was very surprised to find out that we were not having Reddin first. Now, I very grateful that Mattie was our first. I think that she needed that undivided attention for 3 years! When I got pregnant last January, I really felt it was Reddin's turn, and then I miscarried. I'm not sure why it wasn't right then, but when I got pregnant in April, I once again really felt that it was Reddin's turn. Maybe he just wanted to wait for his cousin Lochlan, so that they could come to this earth together! Whatever the reason, words can't express how grateful I am to have Reddin in my arms now. I love him so much. He is such a sweet little guy, and so mellow. Matt use to dream of him, and felt that he would be a laid back little guy! We love him, and are eternally grateful that Heavenly Father has given us this precious child to watch over while he is here on earth. Reddin is a handsome little babe. Can't wait to meet him! 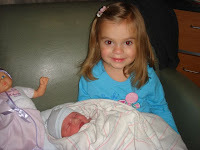 Thanks for sharing the birth story. I'm so glad the pushing was easier this time around! I'm so thankful for blogs and that Reddin will have "his" story in writing. I'm so anxious to hold this precious little boy in my arms! What a beautiful story! Thanks for sharing it with us. Reddin is a super-cutie! What you wrote about Reddin is so beautiful. It made me cry. Is amazing to see how a child brings so much happiness into families. I am so happy for you. You are truly happy with your family. You are very brave to have and epi...those things scare me soo mcuh. So fun to read about his birth! I am so happy I got to meet him and visit with you guys, he's adorable. Reddin really is a big, healthy baby! Good thing you got him out early. I'm so glad everything went well. Hey babe. I love you. Thanks for being such a great mommy. Reddin thanks you too. I love reading the delivery story! Reddin is so handsome and he has such an awesome Mommy!! I am so happy for you guys :)! That's awesome that it went so well. I hadn't heard the whole story yet, so thanks for sharing. He is a cutie. Heather I loved the play by play of Reddin's birth. And I love the name. Is it a family name? Well your kids are absolutely adorable and I too think about you all the time. I would love to come and visit the sun in Florida and go to Disney World with you guys. Maybe when I graduate and start making some money so I can come see you. Reddin did wait a long time to make his debut! 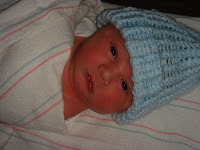 What a cutie--can't wait to meet him someday! What a super sweet handsome little guy! Congratulations!